If you are looking for The Ordinary products for general anti-aging needs, please refer to this post. If you are looking for The Ordinary products for oily, acne prone skin needs, please refer to this post. I’m going to repeat some of the general information I posted in the Anti Aging guide here, in case you haven’t seen it already, since it serves as a foundation of how to shop for the products from the brand. You are welcome to skip it if you’ve already read it from the post before. First, if you are like me and are shopping for traditional cleansers, toners, and moisturizers, you will be thrown off. This is because The Ordinary mainly focuses on treatments rather than cleansers, toners, or moisturizers – so understanding that first and foremost should help you to begin to understand the brand a little better. The Ordinary Treatments are classified into either water based or oil based. It’s important to use water based products first before you use oil based products, as this is the correct way to layer your skincare. 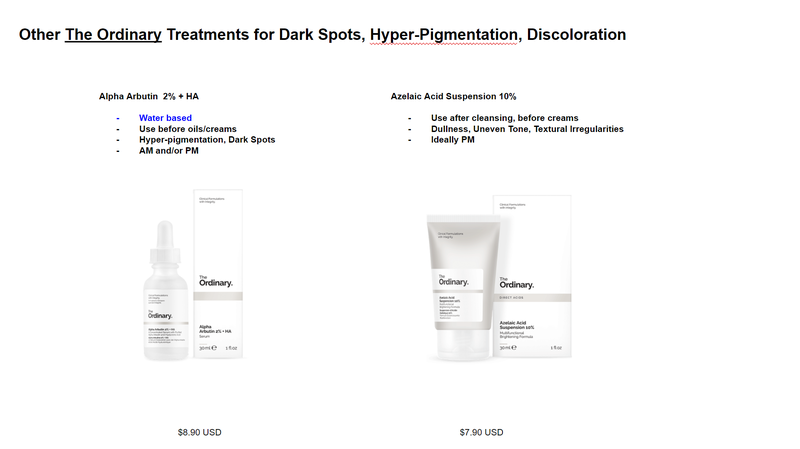 If you’ve landed on this post, that means you’re probably looking for The Ordinary products to treat discoloration and hyperpigmentation issues. Vitamin C is important in any anti-aging skincare routine, from just starting out to further along in the aging process. Vitamin C targets multiple signs of aging, and is especially effective at brightening skin and minimizing discoloration. It can be confusing shopping for Vitamin C, however, because different brands call it different things, as there are derivatives of Vitamin C. Let’s go into a little more detail about shopping for the appropriate Vitamin C treatment in The Ordinary’s offering. Can you see how it can be confusing? Only two of these treatments are even called “Vitamin C” – the others… well, they’re just not very intuitive now is it? The first two items are the most potent versions of Vitamin C among the five treatments available in The Ordinary’s range. They both contain L-Ascorbic Acid, which contains a high concentration of Vitamin C and widely regarded as the most potent version of Vitamin available in skincare products while still being a cost effective solution. The downside is that L-Ascorbic Acid is delivered in powder format, so the absorption is not as ideal as other Vitamin C Derivatives that absorbs better. If you want the most potent, concentrated version of Vitamin C, and do not mind heavy serums with 1) possible tinging 2) a grittier texture 3) formula taking a little time to be fully absorbed into the skin, then you should pick Vitamin C Suspension 23% + HA Spheres 2%. If you want a smoother formula, the most potent, concentrated version of Vitamin C, but do not want the gritty texture and do not mind heavy serums with 1) possible tingling 2) silicone formulas, 3) formula taking a little time to be full absorbed into the skin, then you should pick Vitamin C Suspension 30% in Silicone. (Note: The reason why this is Vitamin C 30% is because silicone slightly impairs the concentration of Vitamin C as it makes contact with the skin, so to make up for this discrepancy there is a higher concentration of Vitamin C in this formula). 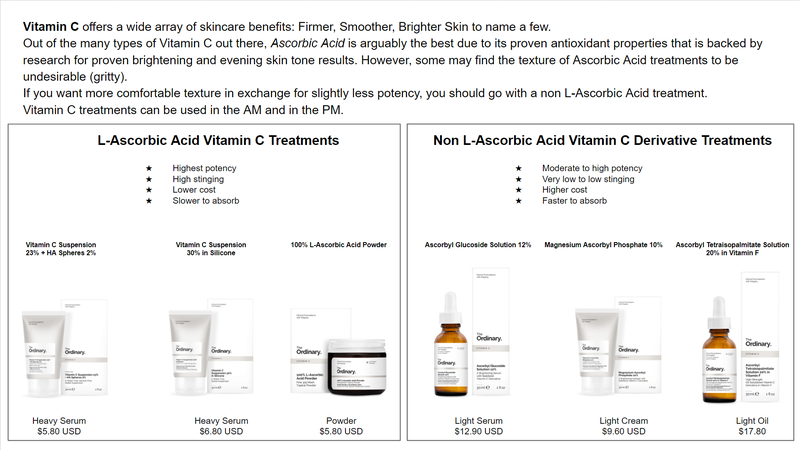 A Note About Vitamin C and Niacinamide: Vitamin C formulas conflict with Niacinamide, which is highlighted in the post about oily/acne prone skin. Please note that you should not be using the two Vitamin C products above in conjunction with the Niacinamide treatment. Alpha Arbutin has long been used in Asian skincare products for its “whitening” and brightening benefits. It helps reduce the look of spots and hyper-pigmentation. The Ordinary’s Alpha Arbutin 2% + HA is a high concentration (vs. standard of 1%) and is suspended in Hyaluronic Acid for moisturization purposes. It can be used in the AM and PM as a brightening treatment after cleansing and toning and before the use of your moisturizer. If you use it during the morning, be sure to use sun protection. Azelaic Acid is produced naturally by the yeast that lives on the skin, and is also found in grains. Its benefits include brightening the skin tone and improving the evenness of skin texture. The Ordinary’s Azelaic Acid Suspension 10% is a lightweight cream-gel product offers a high concentration of 10% high-purity Azelaic Acid that’s appropriate to use both in the morning and night, as long as you use sun protection during the day. 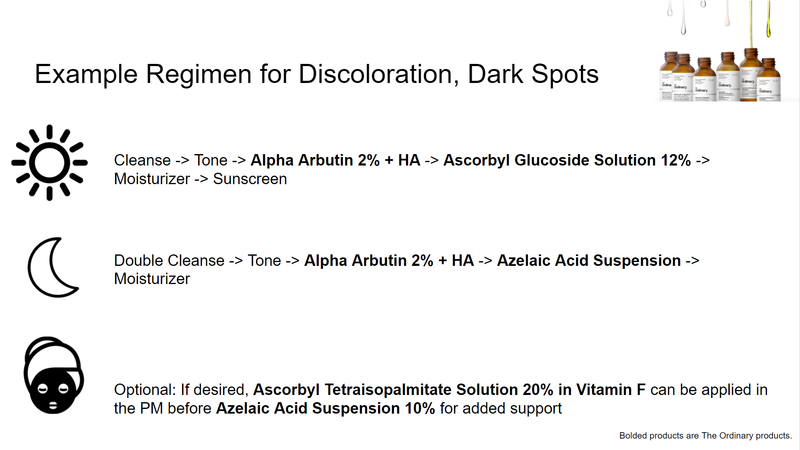 I highlighted the use of The Ordinary’s AHA 30% + BHA 2% peeling solution in my anti-aging post. It can be added to your skincare routine once or twice a week to improve skin texture and brighten the skin. You could consider this as your twice a week treatment, but only if you feel that your skin is not too sensitive for an at-home chemical acid peel. Using the products that I mentioned above, and after doing much research on The Ordinary’s website, I saw that they have example regimens that you can consider. There is a wealth of information, in addition to formats, time of use, and targeted concerns on this page that you can use as reference. For simplicity’s sake, here are the morning and nighttime routines laid out. Please remember that The Ordinary’s treatments are meant to be used in addition to your regular cleansing and moisturizing products. Optional: The Ordinary regimen guide states that if desired, Ascorbyl Tetraisopalmitate Solution 20% in Vitamin F can be applied in the PM before Azelaic Acid Suspension 10% for added support. And here’s your cheat cheat for reference!